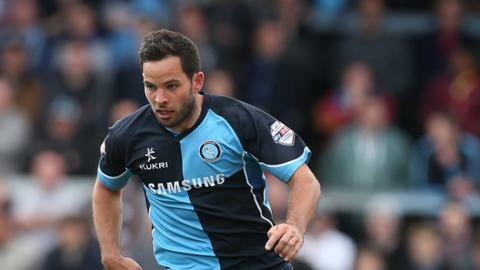 Sam Wood was Wycombe's hero as they secured their Football League survival on the final day of the season. The midfielder opened the scoring from close range before clearing Krystian Pearce's header off the line four minutes later. Steven Craig doubled the lead from the penalty spot before Torquay's Anthony O'Connor was sent off for a second booking early in the second half. Matt McClure wrapped it up as he dinked the ball over Martin Rice. The victory, coupled with Bristol Rovers' defeat at home to Mansfield, ensured that Wycombe's 929 fans would be celebrating long into the evening at Torquay. Gareth Ainsworth's side came out of the traps flying and Wood took advantage after a defensive lapse let Matt Bloomfield in down the right. His deep cross was converted by Wood with his second attempt from six yards after an air-shot with his first. Wood hit the post with an outrageous volley from 25 yards before he got in-between Elliot Benyon and a superb cross from Courtney Cameron for the Gulls' best chance of the game. The second goal came after great work from Matt McClure to rob Krystian Pearce in his own half and bear down on goal, where Anthony O'Connor fouled him in the box. Steven Craig converted the spot-kick and the Scot was fouled early in the second half by O'Connor, earning the on-loan Blackburn centre-back his second booking. The Chairboys wrapped up an easy win with 30 minutes to go as lacklustre Torquay defending let in McClure, who dinked a bouncing ball over goalkeeper Rice. "It's incredible. This ranks amongst the best things I've ever done in my career - to get a club like Wycombe Wanderers, a small club that everyone wrote off, and to survive on the last day of the season in some great fashion is fantastic. "I'm so proud to be Wycombe manager, but I played a small part. Those boys on the pitch gave their everything. The likes of Matt McClure who was in tears after the game last week has come and worked his socks off, scored the winner and after that, all we needed was Mansfield to hold on. "I said to them (the players), can we effect the other games? They said no. I said that we could. We score an early goal and that will filter through, just like it filtered through here. And sure enough Sam Wood took his goal brilliantly." "They say don't get too high, don't get too low. I think I'll leave that one tonight - I'm going to stay as high as I can because that was a special day." Match ends, Torquay United 0, Wycombe Wanderers 3. Second Half ends, Torquay United 0, Wycombe Wanderers 3. Foul by Lee Mansell (Torquay United). Jayden Stockley (Torquay United) is shown the yellow card. Attempt saved. Jayden Stockley (Torquay United) header from the centre of the box is saved in the centre of the goal. Attempt missed. Matt McClure (Wycombe Wanderers) right footed shot from more than 35 yards is high and wide to the left. Substitution, Wycombe Wanderers. Junior Morias replaces Steven Craig. Foul by Nathan Craig (Torquay United). Stuart Lewis (Wycombe Wanderers) wins a free kick in the attacking half. Corner, Torquay United. Conceded by Daniel Rowe. Daniel Rowe (Wycombe Wanderers) wins a free kick on the left wing. Corner, Wycombe Wanderers. Conceded by Baily Cargill. Krystian Pearce (Torquay United) wins a free kick in the attacking half. Corner, Torquay United. Conceded by Matt McClure. Attempt blocked. Krystian Pearce (Torquay United) right footed shot from the right side of the box is blocked. Goal! Torquay United 0, Wycombe Wanderers 3. Matt McClure (Wycombe Wanderers) left footed shot from the centre of the box to the high centre of the goal. Assisted by Matt Ingram. Corner, Wycombe Wanderers. Conceded by Dale Tonge. Jayden Stockley (Torquay United) wins a free kick in the defensive half. Second yellow card to Anthony O'Connor (Torquay United). Foul by Anthony O'Connor (Torquay United). Baily Cargill (Torquay United) wins a free kick in the attacking half. Attempt blocked. Stuart Lewis (Wycombe Wanderers) right footed shot from outside the box is blocked. Attempt blocked. Sam Wood (Wycombe Wanderers) right footed shot from the left side of the box is blocked. Leon Johnson (Wycombe Wanderers) wins a free kick in the attacking half.